How Much Should I Weigh for My Age? With beach season right around the corner, many of us are glaring into the mirror and we are totally unsatisfied with our progress, or lack thereof. “How did I get this way?” often escapes our lips. But with that daunting realization that we’ve been slacking in the gym comes the rush of motivation and belief that we can change our body. If we change our eating habits and start making the gym a routine that we can monitor and track, progress will surely come. Bring on summer! But Wait, How Much Should I Weigh? After our sudden burst of energy begins to fade we start to compare our bodies to those around us. “That person is around my age, but why are they significantly lighter than I am?” The first thing we need to know when trying to guesstimate how much we should weigh is how the Body Mass Index (BMI) scale works. In general terms, BMI generates your ideal weight based on a mathematical calculation that divides your weight in kilograms by your height in meters. After this, we can divide the total by your height once again. This will give you a general sense of how much you should weigh at the moment. 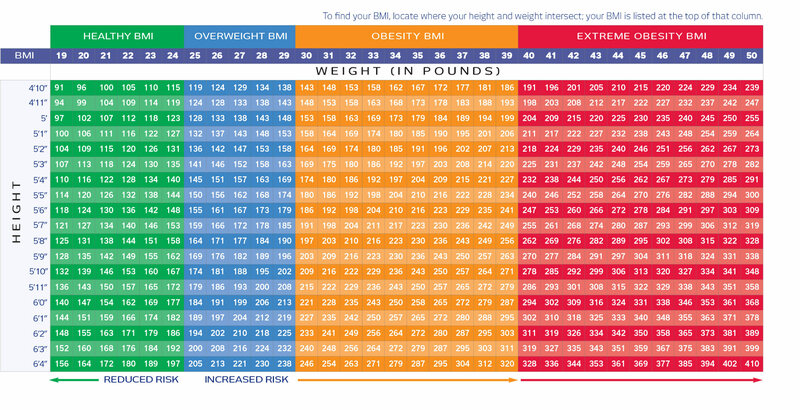 Once you have received your number, refer to the chart below to see if you are currently, underweight, healthy or overweight. Although this chart may seem daunting, it does not define us as a person or who we are. To illustrate this point further, healthcare professionals are now debating rather to use a new system to categorize individuals. Similarly, these calculations do not take into account certain factors like waist-to-hip ratio, muscle mass, body fat percentage, bone density, geographical location, cultural norms and other environmental factors that largely influence a person’s weight and size. Beauty has, and always will be, in the eye of the beholder. Copyright © ChiefCMS 2019 / Theme: Actions, designed by WP DevHQ.